The Ryman Auditorium, built in 1892 is a 2,362-seat live performance venue and is known throughout the world as "The Mother Church of Country Music" which is one of Nashville's true icons. Now, the history of the city's most famous landmark comes to life as never before with a state-of-the-art Soul of Nashville self-guided video experience and new multi-media exhibits that will immerse guests in the rich story of the Ryman. Arrive at the Ryman Auditorium and redeem your voucher for a Tour ticket. 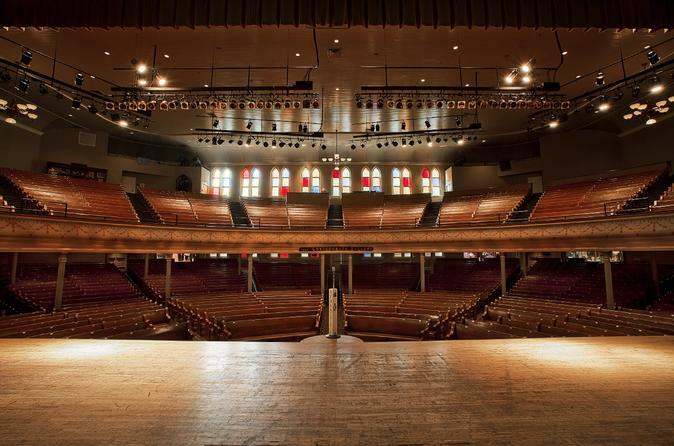 At the start of your tour, you will be immersed in the Ryman’s magical history during “Soul of Nashville,” a one-of-a-kind theater experience which puts the spotlight on more than a century of legendary performances and showcases a new collaboration with Darius Rucker, The Fisk Jubilee Singers, Sheryl Crow and Vince Gill. Five new exhibits are now open! Workin’ on a Building, Showplace of the South, Mother Church of Country Music, Ryman Stage to Screen, and Ryman Renaissance. Peruse genuine artifacts and enjoy videos with hosts Charles Esten, Marty Stuart, Nicole Kidman, Ricky Skaggs, Robin Roberts and Trisha Yearwood as they take you through each chapter of the fascinating Ryman story. Guests can show up at the Ryman Auditorium anytime between 9:00 am - 4:00 pm for their self-guided tour.